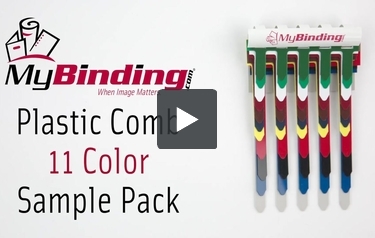 MyBinding.com is proud to offer a great demonstration sample of plastic binding combs. This great sample includes all available colors of standard plastic combs in a simple, easy to show bound sample. These high quality plastic combs are some of the highest quality combs on the market and are designed to fit any standard plastic comb binding machine . Available in a complete range of sizes and colors our plastic combs allow pages to flip freely and lie flat for easy reading and margin to margin photocopying. Each 19 ring plastic binding comb is made of rigid PVC plastic. They won't scratch, chip, peel, or discolor. Colors: Clear, Yellow, Navy, Grey, Burgundy, Dark Green, Red, White, Green, Blue, Black, and Brown samples. Thank you for your question. The samples in MyBinding Plastic Binding Comb Sample Pack are color "swatches" and would not be able to be used for binding.